Designed & Built for Ultimate Reliability! Where there is "heavy" soldering to do, these American Beauty® irons are on the job the world over. Each element is compression wound Ni-Chrome on a steel spool and is Hi-Pot Tested(dielectric withstand testing) at 1200 V. Uses include general production, marine, aviation, railroad, sheet metal and maintenance work. Also, ideal for stained glass professionals. Please take a moment to examine our Model V3700 Voltage Control Unit which saves you money while improving your operations. Ni-Chrome Wound Heating Element - Proven industry's most reliable heating element. Paragon Iron-Clad Tips - Outlasts ordinary tips many times over! Iron Uses Plug-Type Tips - Superior heat transfer. Minimizes maintenance. Hardwood Handles - Selected for their thermal insulating properties and durability. Rubberoid finish. Modular Construction - Easy replacement of any part. These irons meet or exceed UL/CSA certification requirements; special markings available upon request; additional terms may apply. Model 3114 - Available in 60 or 75 Wattage Varieties, this product is one of our two Mid-Range Soldering Irons, offering the power of the Model 3125 in a body that is three and a quarter inches shorter. Perfect for light electrical and sheet metal work, heavy electronic work. Model 3125 - Available in 60 & 75 Wattage Varieties, this product is our standard Mid-Range Soldering Iron. Performs the same applications as Model 3114 but allows operator to work at a more comfortable distance from the application. Model 3138 - Available in 100, 130 and 150 Wattage Varieties, this product is our most versatile soldering iron answering the needs of a wide variety of applications. Higher wattage irons should be reserved for production style usage. Model 3138X - Operating at 175 Watts, the Model 3138X is specifically engineered to function at the higher range of the heating elements parameters. Should be reserved for production style usage or high heat sink operations. Model 3158 - Operating at 200 Watts, the Model 3158 is appropriate for heavy electrical work and intermediate sheet metal work. While the temperature is similar to lower model numbers, this larger iron offers the user greater ability to perform applications due to its larger capacity to store heat. Model 3158X - Operating at 250 Watts, the Model 3158X is similar to the 3138X in the aspect of being specifically designed to function at the higher range of the heating element. Should be reserved for production style usage or high heat sink operations. Model 3178 - Operating at 300 Watts, the Model 3178 is a true workhorse soldering iron and will handle heavy electrical and sheet metal work. 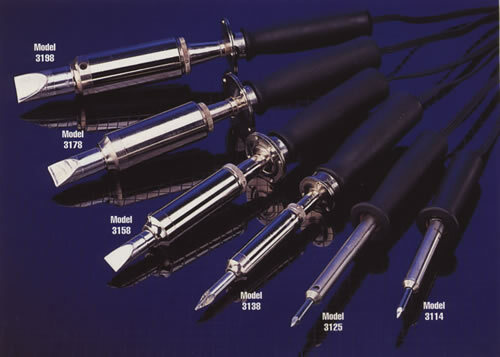 Model 3198 - With 550 Watts of output,the Model 3198 is the largest and most powerful soldering iron in the family. Designed to tackle the heaviest electrical, sheet metal and industrial applications.